For random amusement factor, brought to you by The Pessimist calendar, is a quote by Lloyd Kaufman. I shared a quote on another blog and thought I would mention it here. Because I’m so far behind this year because it exploded in business. He was the producer of somethings called ‘Stuff Stephanie in the Incinerator’ (3.1 IMBD) and ‘Poultrygeist: Night of the Chicken Dead (6.1 IMDB – I’m a little shocked by that one). For a very low score on the first, and a small number of reviews, there are a surprising number of good reviews. It is apparently in the “its-so-bad-its-good” category. It is also one of those movies where the title is misleading. 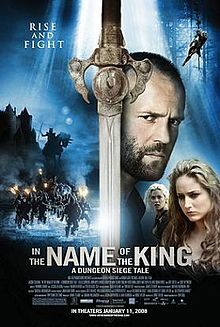 I often wonder if misleading titles are based on scenes that got cut or re-editing changed the movie in a way that the title was now meaningless. The second title has a surprisingly high score given the title. It sounds appallingly bad. I may have to consider watching these one day for a B movie review. Anyway, this producer once stated that, “It is up to us to produce better-quality movies.” Which sounds hilarious with his movie titles. Given the movies this year in general and this summer in particular, it is an even more hilarious quote. For a week now, I’ve sat down and watched a movie every night at 7:00. Mostly science fiction, horror films. Which means mostly bad sci-fi. Last night I watched a fairly bad film with a lot of big names. 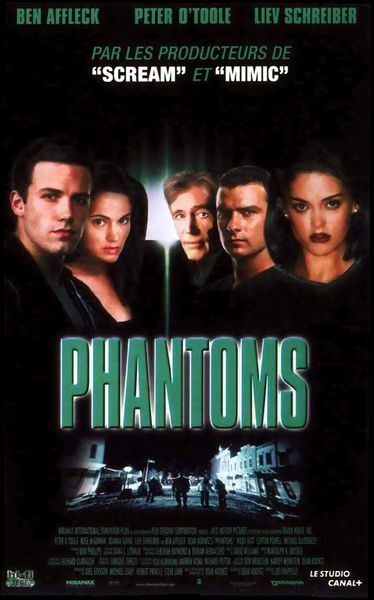 Phantoms is a 1998 adaptation of a Dean Koontz book. I’m wondering if they managed to get all these big names because Steven King adaptations have gone over pretty well. Peter O’Toole does a fantastic job as Dr. Timothy Flyte, a man who got drummed out of academia because of an outlandish theory on missing civilizations that turns out to be exactly what is happening in this tiny Colorado town. He now writes bizarre stories for a sensationalist news rag for the paycheck. Joanna Going is the local doctor who brings her sister to town to stay with her. She is an actress who seemed vaguely familiar. Looking her up, she has had an erratic film career from the early 1990’s until now, often going a year or two between films. 1998 was her busiest year in which she did 3 films. Rose McGowan is the younger sister and plays a typical Rose McGowan character. Liev Schreiber (Sabertooth in X-Men Origins: Wolverine) played the deputy sheriff, who has every indication of being a really creepy guy before he gets killed and becomes an extension of the monster. Ben Affleck is the Sheriff. The best performances seem to come from O’Toole and Schreiver. McGowan and Affleck give their typical performances. I don’t know much about Going but her performance was rather indifferent. The special effects were reasonably well done. But the writing wasn’t the best. The opening scene was really weak. The story was so whittled down that the film seemed like it was made based on an outline what never had the details filled in. The monster kills and eats people but absorbs their knowledge. The people, not knowing what it is, think it is a demon or satan. As a result, after killing a church full of people, the monster thinks that is what it is. It decides it needs a gospel of its own. One of the visitors to the town like to read a cheap news rag filed with fantastical stories. This person had read the theories put forth by Dr. Timothy Flyte. The result was that the monster lays a sort of trap to get him to the town. Flyte is its ‘chosen’ witness to write its gospel and make people worship it. One of the problems is that it kills the deputy and later takes on that form. When it does so, it talks normally through the deputy. But when it kills other and takes their form, it just opens the mouth and words come out. Not normal speaking where you move the jaws and tongue and lips. Why can it talk normal one way but not the other? The special effects, sound and film editing were all better than 100 Million BC that I watched the night before. But the story was more poorly developed. On the other hand, the transitions and resolution were all written and directed better in Phantoms. The Phantom also had slightly better acting, the best part being where Peter O’Toole taunts the monster into revealing the main portion of its body so they can try to poison it. Scheiber also had a good part where some people are talking about monsters and aliens in a bar and an officer a few seat down laughs. They want to know what’s so funny and the deputy says, “Do you want to see something?” So a part of the creature did survive after all. So if you like B-Horror or B-SciFi, you may or may not want to give this movie a view. The decapitated heads and hands are not that well done, but the rest of the effects are good. The film does a pretty good job of building suspense. Nothing is too gory but it may make you jump. Acting is 6 of one, half a dozen of the other. If you like Peter O’Toole in general, you may want to give it a view. Do Not Watch This Movie. I give it an F.
I wanted to watch something before going to bed. So while I’m puttering around, my roommate starts a Netflix movie. Holiday in Handcuffs. Melissa Joan Hart and Mario Lopez play the lead characters. Hart breaks up with her boyfriend and loses her job just before Christmas. To save face with her family, she kidnaps Lopez at gunpoint and takes him up to the family’s isolated Christmas cabin. She tells a rather weak story to her mom and dad so they don’t believe Lopez when he tries to say he was kidnapped. I can’t watch it. It’s really bad. Every moment that is supposed to be funny is just sad and pathetic. Sometimes embarrassing and downright painful. The acting comes off as stiff and wooden from everyone except Lopez. It is like watching a train wreck. Only a train wreck would be better. It would be more interesting. It’s really sad when a disaster with a high likelihood of fatalities is preferable to a movie. A slug or snail creeping along the ground. Molasses almost any time of year. This year, with the heat wave, it might be moving a bit faster. Time when you are standing in a long line. Trying to run in water. Trying to run in loose snow. Trying to run in soft sand. The hands on a clock when you are in a medical waiting room. According to friends who had babies, the last month of a pregnancy. The evening if you have great plans the next morning. For children, Christmas Eve lasts forever, unless you do gifts on Christmas Eve, then it is that day that lasts FOREVER. The delivery guy when you order food. Unless it is Jimmy Johns. Any movie you don’t like. The first two chapters of Island of the Blue Dolphins. Preparing and cooking homemade lasagna when you are really hungry. American trains in comparison to most other industrialized countries. American internet speeds in comparison to most other industrialized countries. Work on a light day. Over the Hills and Through the Woods, To Grandmother’s House I go. I’m WAY behind on reading blogs. I’ve dumped a bunch of them into folders to read later. Some are in folders specific to the writer, the rest are in a massive folder called Word Press Saves. Maybe I’ll get caught up before I die. Hmmmm, probably not. I seem to get behind once a week. So if I’m suddenly replying to things that are rather old, I’ve found some that I got behind on before and to which I have finally gotten. In the mean time, an unabridged Clive Cussler book is fantastic for long drives. It was about 14 hours long. So it filled my drive each way, 7 hours there and back again. I really enjoyed Lost Empire, despite the huge stretch linking such diverse things that Cussler takes. Or maybe I like him because he is able to do it in a way that creates a roller coaster ride of an adventure store. It is also why I’m one of the few people who seem to like the movie Sahara, based on his book of the same title. It’s a fun ride despite its flaws. It is a boy’s adventure story all grown up. The stories sure make the miles fly past when driving. Driving up Iowa and though South Dakota is pretty boring. Rest stops are either too close together or to far apart. One thing about long drives that really annoys me is when you have signs for gas and you can’t see anyplace from the road. There are some hills along this drive. Some small patches of forested area. But on the whole, not a lot of totally blind areas. Some signs do say the distance to the gas or food from the exit. But I always start to need gas at the towns for which they DON’T provide the distance. Maybe it is a personal blind spot, but if I pull off the highway for gas, I want to still be in sight of the on and off ramps. I have this fear of getting lost in the middle of nowhere. Or maybe I just watched to many bad horror movies that start where the lone woman, driving across country, pulls into a hole-in-the-wall town for gas and/or food. Speaking of movies, on the day in-between my two driving days, I watched some movies with grandma. We watched the original, and then the remake, of The Parent Trap. Both have problems but I’ve decided that this is one example where I like the remake better. In the 1961 remake, I think they cut the girl’s hair short to try to make her look younger. Every time I watch it I can’t stop thinking about how much I hate the haircut. It never fails. It distracts me the entire way through. There is also the fact that the rough and tumble, John Wayne inspired, father (Mitch) is one again going to marry a prissy woman who doesn’t like the outdoors. Which, based on some lines in the movie, seems to be one of the major reason they split up. When the mother (Maggie) punches Mitch in the eye (very badly, no one hits like that) Mitch makes a comment that sounds like Maggie frequently resorted to violence to end arguments with him. The only character that is really amusing is actually the reverend who seems highly amused at the interpersonal relationships and how everything is playing out. The second movie has a major problem with how strange it seems that a Brit that lives in England would send her daughter to a summer camp in the U.S. Everything else is much more funny. Of course, this was back when Lohan could still take direction and therefore could still act. And she still looked cute as a button. Red hair was so much better on her than that bleached out mess she has now. The ending is also slightly more believable in which the mother backs away and returns to England and this time her ex-husband comes after her, thereby correcting his first mistake of NOT chasing after where when she had hoped she would, years ago. That is a terrible sentence. But I’m not fixing it. My back hurts too much. Because another thing I learned this weekend was that it is possible to OVER massage a sore muscle. My grandmother has this massaging seat you put over a chair. It does rolling and kneading. It also has heat. You can also isolate it. I was hoping it would loosen up the perpetually sore muscles around my right shoulder blade. I’m not sure how long it lasts before it powers off. I used it through 2.5 power cycles. When I went to bed last night, I lay down and was going to use my percussion massager on the muscles since they were still sore. It hurt like hell. And it still does today. Before leaving, that Hatfield’s and McCoy’s special came on. I wish I could have stayed to watch it. I got really interested in a matter of minutes. Now I shall have to go find it.